Our stewardship efforts at the Conservation Management Area (CMA) could not happen without our valuable volunteers. In a typical year, more than 2,000 hours of volunteering occurs in and around the site. We work with a combination of dedicated GSWA stewardship volunteers, eagle scouts, and civic, corporate, and community groups to achieve our land management goals. 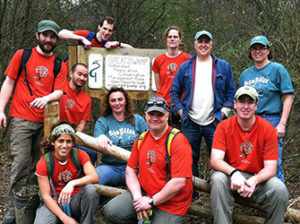 A group from REI poses for a picture after a workday at the CMA. Without corporate workdays, GSWA would not be able to undertake the exhaustive land management work we complete at the CMA. Corporate workdays with GSWA are an effective way to make a real difference for the environment, health, and education in New Jersey, all while serving as a great team building exercise. We can schedule weekday or weekend workdays, and these typically take place from March to November at the property. If you are a corporation interested in volunteering with us, contact GSWA’s land steward, Director of Education and Outreach, Hazel England at 973-538-3500 or hengland@greatswamp.org. If you have a church, school, college or other civic group, volunteering for a workday at the CMA can be a great way to give back to your community and have fun with your group at the same time. We can schedule weekday or weekend workdays, and these typically take place from March to November at the property. Workdays involve a mix of tasks and are best suited for adults and children aged 10 and up with their parent. If you are interested in volunteering, please contact GSWA’s land steward, Director of Outreach and Education Hazel England at 973-538-3500 or hengland@greatswamp.org. GSWA stewardship volunteer and member Frank Stillinger transports material to build a boardwalk at the Conservation Management Area. GSWA is always looking for individuals to volunteer their time for stewardship activities at the CMA and around the watershed. Volunteers monitor our deer fence and make small repairs, take part in large group workdays, and help us keep the CMA in tiptop condition for others to enjoy. Some volunteers help us with ongoing maintenance, while others use technical expertise or carpentry skills help us build the many projects we need at the site. To learn more about volunteer opportunities, visit our volunteer page, or email GSWA’s land steward, Director of Education and Outreach, Hazel England at hengland@greatswamp.org. We love to work with Eagle Scouts! Past Eagle Scout projects have included the creation and installation of signage, boardwalk, and interpretive materials. If you are serious about working hard to develop a stewardship related project with Great Swamp Watershed Association, please contact us. We prefer to hear from the Eagle Scout themselves, and will schedule a meeting to discuss interest, project needs, and time commitment. Please contact GSWA’s land steward, Director of Education and Outreach, Hazel England at hengland@greatswamp.org.